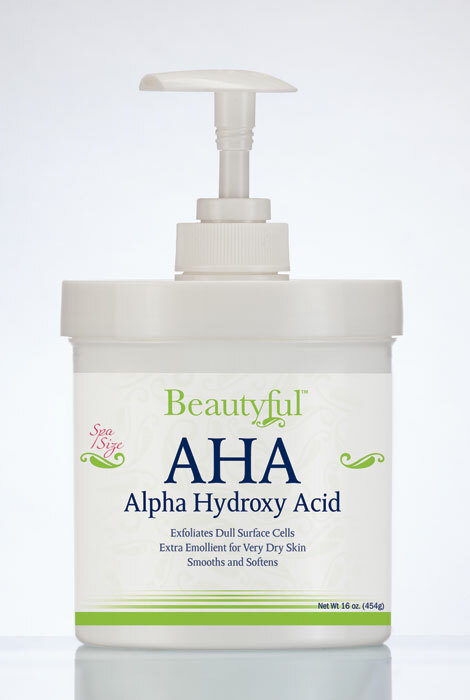 Beautyful™ AHA Alpha Hydroxy Acid Cream - 16 oz. In a “more is more” 16 oz. spa size, this generous, convenient pump jar lets you enjoy the best in skincare at a fraction of the cost. Dual-purpose AHA cream deeply hydrates dry skin, while exfoliating surface cells for smooth, even and radiant-looking skin. Compare at $60! Water, Mineral Oil, Cetearyl Alcohol, Glyceryl Stearate SE, Butylene Glycol, Glycerin, Aloe Barbadensis Leaf Juice, Isopropyl Myristate, Ceteareth-20, Caprylic/Capric Triglyceride, Hydrolyzed Collagen, Camellia Sinensis Leaf Extract, Anthemis Nobilis Flower Extract, Acrylates/C10-30 Alkyl Acrylate Crosspolymer, Disodium EDTA, Citric Acid, Glycolic Acid, Mandelic Acid, Lactic Acid, Triethanolamine, Phenoxyethanol, DMDM Hydantoin, Iodopropynyl Butylcarbamate. I layer it with the AHA and collagen creams for a 1,2,3 punch! This is a great hand cream too! I can tell how much better my hands look in just the short time I have been using it. I use this product at night,can be used on entire body. Make sure you use a SPF creme to keep the sun from damaging the skin. Look everything doesn't work for everyone. The lotion IS generous in size. It doesn't have any smell, for those with aroma allergies. I usually by the Argan oil, which is excellent for keeping your tan even. I thought I would try this on my face since I have uneven tone, and so far I have seen an improvement in my skin. Our family lives on natural cures etc. Bust we also live in the "Twilight Zone" of Arizona, where we have 101 to 111 degree heat. Yes, I would recommend this product for great skin. Might take some time for skin to adjust. Switched from oz new formula because it caused me to break out, and aha did for the first couple of weeks. But that's over, and this cream is the best I've found since the original oz. absorbs completely and not sticky like Amlactin. Sounds like it could help with my lackluster skin. Also, good price. I want to try a new product to see if it works for me. Good product at a reasonable price ! exfoliating is so important to haelthy skin. Love that soft skin feel! This is a product that I"m familiar with and I"m hoping that the quality with it's sale price is still an excellent product--I will let you. good reviews and great sale price. "I want to start paying more attention to my skin"
The Alpha Hydroxy is very good for my skin, it has been very hard to find in stores lately. Its formula is close to my current cream. I hope it works for the face too. I use aha pads, so now I want to try the cream to see if it work as good as the pads. I chose this product to tone my skin. This cream works my hobby face looks very bright and clean will recommend this cream. Great for skin. All products are fantastic. AHA is great for skin softening. chest , and any other dry area on the body that needs it . However , I will only purchase it when the price is 17. 99 for two ! Free shipping is another incentive ! Same answer as the Collagen Skin Rescue Lotion. I have read good things about AHA and wanted to try it. Happy to get this big jar at such a reasonable price. the best product of it's kind I've ever used!! I was told it's a good face cream. I think this is very important for healthy skin. In Grand Junction, CO's monthly newspaper for seniors, The Beacon,an article under 'Healthy Geezer' by Fred Cicetti mentioned, "Daily application of alpha hydroxyacid lotions have been shown to increase skin thickness up to 15 percent in patients with sun-damaged thin skin." I found you when I Googled the term. I have dry skin that does not exfoliate well. I have adult acne along jaw line and my Dr. recommended AHA. How will it help my acne? BEST ANSWER: Thank you for your question. This item is designed to deeply hydrates dry skin, while exfoliating surface cells for smooth, even and radiant-looking skin. We hope this information will be of help to you. what percent AHA is this cream? BEST ANSWER: Thank you for your question. The manufacturer is unable to disclose the percentage of AHA alpha hydroxy acid in the cream, as this is for cosmetic uses, it is not a pharmaceutical grade product. We hope this information will be of help to you. What is the percentage of AHA in this cream ? BEST ANSWER: Thank you for your question. Unfortunately, we cannot provide this information. This item is intended for cosmetic purposes, not pharmaceutical. We hope this information will be of help to you. BEST ANSWER: Thank you for your question. We have included below a listing of the ingredients for this item. We hope this information will be of help to you. I Love this product! Definitely a good purchase. It has greentea, aloe vers, and chamomile. It has a long list of ingredients water being the first. It is very hydrating and it doesn't sting or burn like some products with alpha hydroxy or retain . (this does not have retain a in it) Purchased the coconut oil for my 2 daughters and they love it!